We have lost a friend. 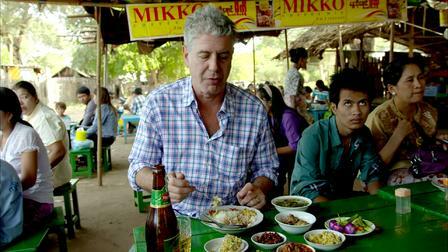 Anthony Bourdain doing what he loved best — eating local food with local people. Anthony Bourdain’s suicide has shaken me. I feel as though I have lost a friend. I think a lot of his fans feel this way. He was a gifted writer who opened up the whole world to many of us. His words, both written and spoken, took us to places we likely never will be able to go. Bourdain had a rare gift for storytelling, and an even rarer ability to make readers (and later, viewers) connect with him. Mike loved the chaos of restaurant work. One night, months after he’d had to give up work because of his illness, while we watched Bourdain doing a double shift as a line cook, Mike sighed. “I know this sounds crazy, but I miss that,” he said. After my son’s death, it seemed Anthony Bourdain was a connection to Mike’s spirit. His love of travel and his respect for the foods of other cultures, his curiosity, his passion and his abiding love for meat in tubular form, all reminded me of my son. He was a recovering addict, and I have no way of knowing whether his addiction contributed to his death. Mike was a recovering addict, too, but his recovery gave him reason to live. I’m not angry at Bourdain for taking his life and depriving us of his wisdom. Perhaps I should be, but that’s not what I’m feeling. You see, I’ve squirreled away extra pain pills, just in case. I’ve walked close to the edge of a precipice and thought about taking that one extra step, or considered turning the steering wheel toward a bridge abutment at 70 miles an hour. I’ve battled depression my entire life, and after my son’s unnecessary death, I seriously considered checking out of this life. Yes, I know I still have much good in my life, and it’s concentrating on that that’s kept me here. But it is a real struggle some days, and the struggle gets to be too much for some people, as it obviously did for Anthony Bourdain. Don’t accuse me of being selfish for considering suicide because you don’t know the pain I endure some days. It is not a selfish act; it is an act of desperation, a way out of the unendurable. You can’t know what that’s like if you haven’t been there. Suicide rates have gone up 25 or 30 percent since 2000 in this country. Think about that. It’s not happening in other countries, not in places where people have hope that their lives will improve. But we in this country are subjected to jobs that don’t pay half of what it takes to live, to denial of medical care, to crippling debt just for trying to get through college. 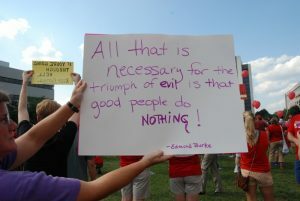 Too many of us have no hope of a better future, and that becomes unendurable for increasing numbers of us. But even for people who seem to have everything, as Bourdain did, can suffer indescribable pain. You can only do that for so long. You don’t know who among your friends and family members is in pain. I have been surprised any number of times by the confession of someone I love that they have crept up to the edge of that same abyss. When thoughts about dying come into my head, I think about the work I’m doing to try to make this country a better, more just place. Working with Rev. William Barber in the Moral Monday Forward Together Movement, and now the Poor People’s Campaign, has given me hope that things will improve, even as I watch them deteriorate. Antidepressants did little to alleviate my depression, and therapy did even less. I combat it by staying busy as an activist, by staying connected to the people I love, by trying to make the world a little more just. Still, there are moments I think about dying, about being at peace, being reunited with my son and my sister. But, so far, I have been able to remember that on some level I still want to be here. I want to make a difference, and I can’t do that if I’m dead. That’s what has worked for me. So far. The worst enemy of a person with depression is isolation, and one of the hallmark symptoms of depression is isolation. We hunker down, pour a glass of wine — or two, or three — and stew in our own juices. The more we think about our misery, the more likely we are to end our lives. So, if you know someone who might need a little encouragement, a little love, a listening ear, no matter how glamorous their life seems to be, reach out. You might be the connection to this life that keeps them here. The suicide prevention hotline number is 800-273-8255. BOTH are available 24 hours everyday! Imagine being yanked from your home and family for a year at a time, three, four, or even five times, shipped to a war zone where you never know who might be trying to kill you and having to kill other human beings just to stay alive. You watch friends die, see children maimed, witness suffering all around you. Then you come home and you’re expected to pick up where you left off. Of course, the more deployments you have, the more difficult it is to return to a “normal” life. I know how it was for my contemporaries who served in Vietnam and they only served one tour for the most part. They had nightmares. One vet in his 50s told me he hadn’t slept through the night since he came home. A friend’s brother insisted on sleeping under his bed for months. Any loud noise would set off a panicked reaction. I can’t imagine what it must be like to endure that four times. The war in Afghanistan is the longest in our nation’s history, and never have we waged a war with such a small percentage of our young men and women carrying on the fight. They’re coming back with post-traumatic stress disorder and major depression, traumatic brain injuries, missing limbs … and we’re not caring for them, even though the promise of care was something they were counting on when they signed up to fight. Now, a three-judge panel of the 9th U.S. Circuit Court of Appeals in San Francisco has concluded that the Department of Veterans Affairs’ treatment of vets with psychiatric illnesses is so bad it’s unconstitutional. Two groups, Veterans United for Truth and Veterans for Common Sense, brought the suit against the Veterans’ Administration, charging that veterans returning from war aren’t getting the care they need and are committing suicide at alarming rates as a result. In fact, more than half of all veterans treated by the VA since 2002 have psychiatric issues — some 330,000 so far, according to Veterans for Common Sense. And there’s plenty more out there waiting, not to mention the fortunate few who have health insurance that will cover what they need. About one-third of the veterans who commit suicide are under the VA’s care. When they call asking for help, they’re met with wait times that stretch into weeks, and the times are getting longer. They can’t even make a case for expedited care because the VA doesn’t have the capacity to deal with all of them. But the three judges, one of whom was appointed by Ronald Reagan and the other two by Jimmy Carter, said veterans and their families have a constitutional right to receive care for illnesses and injuries sustained in the course of duty. The United States Constitution confers upon veterans and their surviving relatives a right to the effective provision of mental health care and to the just and timely adjudication of their claims for health care and service-connected death and disability benefits…their entitlements to the provision of health care and to veterans’ benefits are property interests protected by the Due Process Clause of the Fifth Amendment. The deprivation of those property interests by delaying their provision, without justification and without any procedure to expedite, violates veterans’ constitutional rights. Because neither Congress nor the Executive has corrected the behavior that yields these constitutional violations, the courts must provide the plaintiffs with a remedy. It’s not going to be cheap to fix this, but we have to try. In fact, men and women are coming home so broken that there’s nothing we can do to heal them, but we can’t let them suffer without trying to ease their pain. Too many people talk big about supporting our troops, but they don’t want to end the war and they don’t want to pay for proper care. Well, it’s time to pay for what we’ve done. This is what happens when we try to fight wars on the cheap, with borrowed money, while we cut taxes on the wealthiest Americans and rob the neediest Americans of programs they need to live. Our military people don’t come from wealthy families. Most of them joined for the benefits they were promised — health care, an education, job training, and a chance to defend their country. They can’t afford to pay for the care on their own. We sent these people out, not just once, but up to five times. We have an obligation to fix what we broke.